Words matter, and webmasters using best practices tell small business owners Google reads every word on every page. In fact, Google not only reads every word, all search engines reads file names for images and file names for each page in the ongoing effort to deliver the search results best suited to a user. Pegasus Ventures develops each page of each website with an eye to giving Google lots of descriptive words. Also, Pegasus Ventures purposefully avoids the passive, and far too ubiquitous, forms of the verb, "to be." "To be" not only makes for sloppy and trite text, "to be" hurts creating opportunities for a website to gain higher visibility. Too many local web designers and developers create bad habits in writing for websites. For example, using passive verbs like, "am, are, is, was, were, be, and been, being." Pegasus Ventures wants local small business owners in the key Grand Rapids market it serves to capture more traffic using smarter words. Smarter words forces the website designer to find better ways to tell the story of a small business. Okay, hang on. Yes, your local website designer thinks about keywords. However, good web site development for the local small business owner focuses on overall web presence. 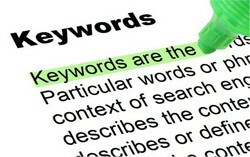 Search engines use literally hundreds of markers in determining what search results to deliver for a search query. Keywords represent just one marker. Solid web design and development puts the focus on great content following best practices. Content matters most and spending great volumes of time on one marker fails to promote the overall goal of capturing more traffic. Pegasus Ventures and other website designers use Google Analytics to tailor the ongoing process of building web presence for a small business. Google Analytics provides real data to help understand how users find a website guiding ideas to improve the small business website. The enemy of good website design; pronouns and the worst of the worst? We. Pegasus Ventures owner, Robert Dewey once remarked, "Small business owners often hire Pegasus Ventures to redesign an existing website. Reading the content of the previous designer I often get the feeling my predecessor tried to get the company seen for one word, "we." Oddly enough I see this most with one person businesses where no "we" even exists." No one advocates the immediate banning of pronouns and, yes, sometimes proper nouns in website design and development comes off a bit weird. Yet, it helps far more when websites use company names and other nous rather than, "we." Designing higher visibility for any website works better using proper nouns; it gives the search engines something to see other than, "we." And by the way, for the one person small business, tell customers! Customers love connecting with the boss, right? Big selling and marketing plus for the smallest local business owner to share this information!